This recipe is from A Baker’s Field Guide to Christmas Cookies. In that recipe, as presented below, you will see that they are made a bit smaller. I sometimes like to make them a bit larger, as in my photo, where I use two teaspoons to gather about a walnut sized blob of meringue batter and then baked them for about 10 extra minutes at 275 degrees F. The yield will be more like 30 cookies. Description: These are the cookies I mention in the introduction – my first ever memorized recipe that I made again and again. 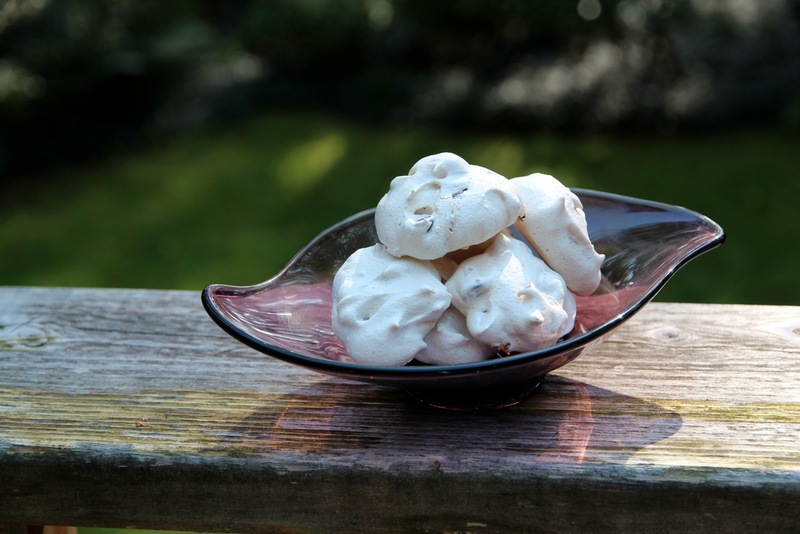 These are easy and quick to make and combine sweet crunchy vanilla scented meringue with toasted walnuts and dark chocolate morsels. Historic Notes: My Mom found this recipe in a church cookbook where they were called Surprise Meringues. The surprise is that you don’t see the chocolate or nuts inside the cookie; when you bite into them there is an explosion of flavor and textures. Preheat oven to 275 degrees F. Line two half-sheet pans with parchment paper. Place egg whites in a clean, grease free bowl and whip with balloon whip attachment on high speed until foamy. Add cream of tartar and whip until soft peaks form. Add sugar gradually and whip until stiff, but not dry, peaks form. Beat in vanilla extract. Fold in chocolate morsels and walnuts. Drop by generously rounded teaspoon on prepared pans 2-inches apart. Bake for about 25 minutes or until completely firm and dry, but still white; you should be able to lift the cookies from the pan. Slide parchment onto racks to cool cookies completely. (Cookies may be stored at room temperature in an airtight container for up to 2 weeks). Good Cookie Tip: After you chop the walnuts, place them in a strainer and shake over the sink to remove any powdery residue. You will be left with just firm, crunchy pieces of nuts and the texture of your cookies will be even better than if you skip this step.